The site, marked with blue lines. Ryton Organic Gardens could fetch up to £4 million after being listed for sale as a site for potential ‘residential redevelopment’. The charity Garden Organic has listed the site, located between Wolston and Ryton-on-Dunsmore, for sale due to what it said are high running costs. The charity said: “In recent years, it has become clear that the running costs of our base at Ryton are limiting our ability to operate to our full potential. Garden Organic said a definite decision to sell has not yet been made, and that it will consider all options. 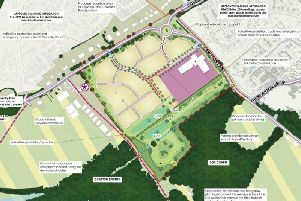 It said: “We will be exploring all possible options for the site, but we need to release the financial pressure that comes with owning and managing the land and buildings. Formal offers for the site are due on February 15. Estate agent Bruton Knowles said the current rental value of the site is £115,000 a year, but with development it could be over £200,000. If sold the site could fetch up to £4 million, but could then be built on. The estate agent said: “The site is in the West Midlands Green Belt however discussion with the local planning authority suggests that a (residential or alternative) redevelopment of the site would not be resisted provided it retains the ‘openness of the Green Belt’. The site has been developed since 1985 and consists of a cafe, shop, visitor centre, car park and agricultural buildings together with farmland and organic gardens.